How can I successfully make the change to the water fed pole system? 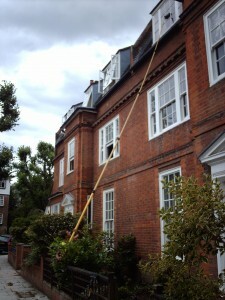 For many traditional window cleaners, the thought of moving over to the water fed pole system is perhaps a daunting one. Your customers have been used to and sometimes even have a preference for traditional cleaning methods. More than likely they have been happy with your work for a long time. However, you’re also aware of the benefits that the water fed pole system has to offer; speed, safety, add-on service opportunities and ultimately the possibility of earning more money. But what if some of your customers don’t want you to use the water fed pole system? How can you make the transition whilst minimizing the risk of loosing customers? Well, many window cleaners have taken this risk with a happy outcome. Based on what worked for them, here are some steps that we encourage you to take for a successful, smooth change to pure water cleaning methods. It’s important you take the time to educate your customers as to how the system works. Explain to them that you intend to start using it because of the numerous benefits of this system. Give plenty of notice. Speak to as many of your customers as possible in person whether this be face to face or over the phone. This will give you a better chance of putting their minds to rest should they have any doubts regarding the system. the customer to call you should they have any questions or reservations. When a window has been cleaned traditionally for a period of time the it is difficult to guarantee perfect results the first time it is cleaned with pure water due to the soap residue which has accumulated in the rubber seals etc. Explaining this to the customer beforehand in the letter can prevent problems due to poor first impressions. Make sure they are aware of what to expect and that the results improve after the first clean. Telling the customer how the system benefits you will not convince your customers that it is a good idea. Instead, mention the benefits of the system from their point of view as customers. Eg. How you will now be able to do a better job of cleaning the frames, how you can now offer extra services to them like conservatory roof cleaning, fascia and soffit cleaning, solar panel cleaning etc. Mention any extra windows that you will now be able to reach with the water fed pole system that previously you were unable to clean e.g. Velux windows or roof lights – this can be a huge selling point. As we’ve just mentioned, using the water fed pole system allows you to offer extra services. Note down which add-on service opportunities there are on every job you have – Eg. Do they have fascia & soffits? conservatory roof?, cladding or solar panels? This would not be the time to go in for the ‘hard sell’ regarding these – mention it as if it’s a benefit to them and let them request the work if they want it. (Once the customer is more familiar with the pure water system, you can push a bit harder for extra jobs like this) This can help you see a quick return on your investment in the water fed pole system, which is also important. One of our readers had an issue with a few of his more scrupulous clients when they noticed he was completing the job quicker with the water fed pole system. They asked why he didn’t charge less. A good response to this is to highlight that the system is more expensive to run, thus balancing the pricing out and allowing it to remain the same – you may want to pre-empt this question when communicating with your customers. After all, the price agreed is not an hourly rate but the price of a service to clean the windows. Investing in equipment to do the job quicker and more efficiently is quite normal but an investment like this wouldn’t make sense if the price had to be dropped thereafter! The water fed pole system is a tool, and like any tool, you need to know how to use it. It may be a good idea to get some practice in before you start on real customers and check your results. They say first impressions count. Make sure you repeat the warning about first-clean results, but try to alleviate any problems the first time you complete your round with the water fed pole system by using extra rinse – you want to try and get rid of as much of the residual soap scum you’ve built up as possible. Be extra vigilant by doing a walk around at the end of every job. Check the results, check for any problems, and if necessary, go over problem windows twice. Pay extra attention to dirty frames and sills. This should improve your customer’s impression of the first clean with the water fed pole system. By carrying out as much of the above steps as possible, you ensure you have communicated with your customers every step of the way and minimized the risk of losing any of them as far as is possible. Many potential customers doubt the system’s ability to get the job done properly – it probably seems to defy anything they’ve ever known about cleaning with water. After all, when you clean the car, you leather it down right? The squeegee was invented for a reason, wasn’t it? Many dubious customers that have finally decided to throw caution to the wind, let their hair down and give the system a go have had bad experiences: “No thanks, I’ve tried someone with that before and it didn’t work” This has led them to the (incorrect) conclusion that it’s the system that doesn’t work. The reality is that the most common causes of people’s bad experiences are a) user error, and b) poor education of the client – not the system itself. Secondly, educating your customers on how the system works is vital. Make very sure they know that the water is specially purified, and because of that can be left to dry naturally. Talk about the benefits of the water-fed pole system – the fact that there are no ladders, no risk of damage, no chemicals, better results and so on. It’s also vital that you set their expectations from the start. This is hugely important when taking on new clients, or when making the change from traditional methods with existing clients. For example, the first time you clean a window with the water fed pole system, the results are not always perfect first time, no matter how thoroughly you do the job. This is usually because large amounts of ingrained dirt around the window frame and seals, dirt that is never removed by traditional methods, are dislodged easily by pure water cleaning. Because of the amount of it, it’s difficult to get rid of completely on the first clean. In addition, particularly if the windows have been cleaned for any length of time by traditional methods, you will find a build-up of soap scum is released from the seals of the window (which is why you’ll sometime notice a window foam up) when you clean it. Again, you release potentially years’ worth of soap build up that can continue to seep onto the window after you have left, affecting the finish. Take the time to look at the job in hand. Are there any leaded windows? Lead oxidises and forms a white powdery substance that can affect the finish in a very similar way. Wooden frames with old, powdery paint can also have a similar affect the first time they are cleaned with pure water. Whenever I take on a new customer, I make sure I take the time to explain that this could be the case, and that after the first clean or so, the results are better than ever, even lasting longer. Provided you set this expectation, it’s very rare that you will get any complaints over the quality of the first finish and, as long as you use pure water and the right technique, the results will speak for themselves in the long run. I’ve found that if you get this right, even the most cynical of customers can become a convert to pure water window cleaning. Mastering this when you are developing your business will only help you gain more long term customers and ultimately more revenue. Van owners understand the need to buy the right insurance cover because getting it wrong can affect their livelihood. A quick and efficient claims service is imperative. We also run a number of special insurance schemes for trade and retail businesses. 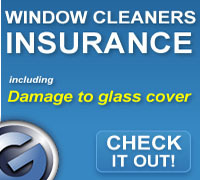 For example we have some great deals for van insurance for window cleaners. For a quote, apply online, telephone, or visit a branch today! As a window cleaner it is important to also think about Public Liability Insurance. If your business is responsible for injuring a member of the public or ‘third party’ (ie. not an employee of your business) or for damage or destruction of their property, public liability insurance would cover you for any related costs, such as compensation payouts, the cost of repairing damage, or legal expenses incurred in defending the case. 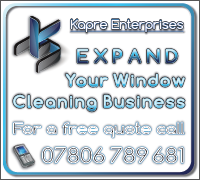 Starting your own window cleaning business and becoming your own boss is an attractive and exciting prospect. However, getting a window cleaning businesses off the ground is not as easy as many think; there is a lot more involved than buying a bucket and chamois leather and knocking on a few doors. Starting the sales process is the hardest thing, you have no reputation, no contacts and no customers. The easiest way to win new customers immediately is by asking friends and families. 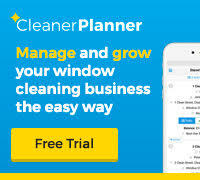 This will allow you to build up a selection of jobs and get you out there, cleaning windows. Begin by turning your van into an advertising medium by promoting your name, company and contact details; this gives you an identity even when you’re not on the job. You will then need to start canvassing for new jobs; this is the most crucial part of the trade. 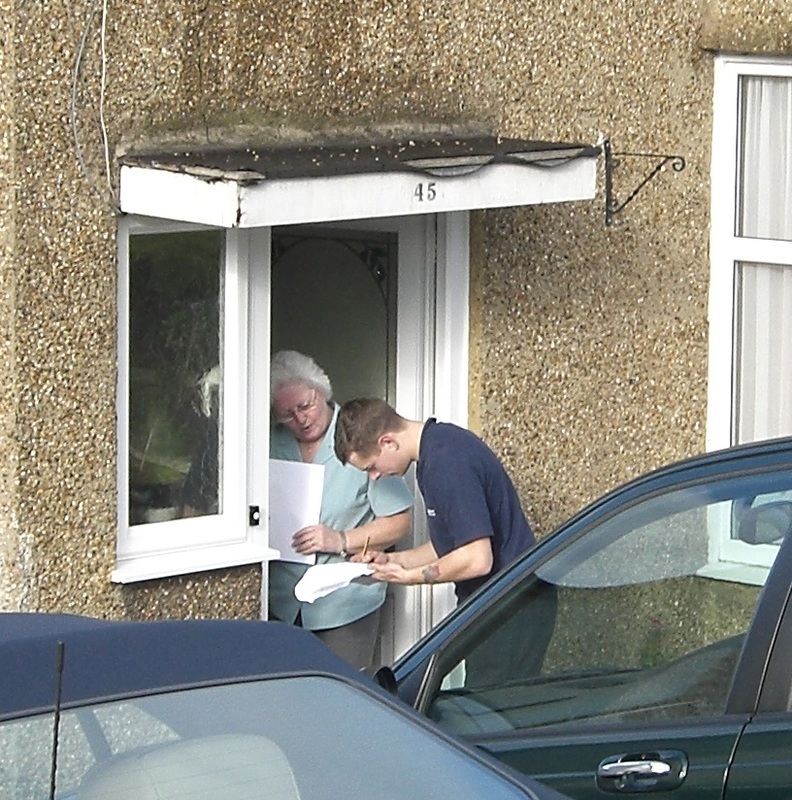 Canvassing should be subtle and detailed, you want to work out if an area is currently covered by another cleaner and see if there are houses in the area not covered yet. Start on a road, knock on a few doors and ask a few pertinent questions. If another cleaner has the entire road, move on to the next, you will soon find gaps emerging. There will be a lot of competition out there. Undercutting the competition will create more enemies than customers, so please avoid doing this. Dropping leaflets through doors will not win your business on its own; you need to go out there and talk to customers, wining sales through face-to-face contact. Window cleaning is a something everyone needs without realising it. Explain the service; be friendly and charming. If somebody is not home or needs to think about it, drop in a leaflet and pop back. Once you win a customer round, sealing the deal with a price is very important. Building a window cleaning business canvassing is a great way to start. Judge the amount of time the job will take by looking around the property; don’t just accept the customer’s opinion. 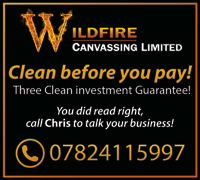 First cleans will be more time consuming so you can potentially charge more, unless, of course, you are really keen for their business! You will then need to discuss how frequently you will clean the property – suggest once a month and then negotiate from there. Be honest and find the right solution for the customer. Get their name and contact number and then call them back to confirm the time and date you have arranged. Most important to building a reputation is the quality of the job you provide. Too many jobs and not enough hours and you won’t do the job properly. Word of mouth is key, so you need happy customers and good recommendations. Plan your time effectively: estimate how long it will take to carry out each job and don’t take on more work than you can service. In time you will become more efficient and take less time to do the same number of jobs well. Equipment is also vital: do your research and find the right products. Unger window cleaning products sell a range of affordable, high quality equipment which will get the job done. For other equipment information visit cleaning supplies from Click Cleaning. Soon you will generate business without having to do anything; customers will approach you or recommend you to friends and family. This is now a good time to advertise; put an advert in the local paper or on Google ads and set up a website that gives you more exposure. Social media is now also a popular method of advertising and is easy to set up and maintain at no extra cost. Create a Facebook profile, share it with your friends, post some attention grabbing news items and you will soon have a recognised local name. With more work coming in you will need to manage your growth with new staff and more equipment; always plan ahead and keep an eye out for employees who will help you develop your trade. Work hard, take pride in your work and your reputation will grow in no time! Word of mouth is the most effective way to advertise. Things that are out of the ordinary get people talking. The method shown in this video might not be practical for all window cleaners but it works well for me and it may give you some ideas. 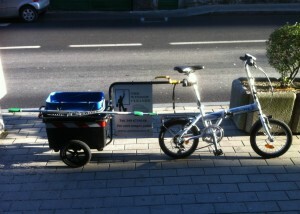 It reduces stress, saves time, saves money, its green, it keeps you fit and it works great as an advertising medium. Can’t be bad! GLEAMING INSURANCE have launched their specialist scheme for the window cleaning industry to offer window cleaners insurance to all types of businesses. By visiting www.gleaminginsurance.co.uk you buy the specialist cover online and receive electronic documentation immediately. It is so vital for window cleaners to ensure that their insurance policy includes “damage to property worked upon” and “treatment risks” otherwise anything that is damage whilst being cleaned will not be covered. GLEAMING INSURANCE has been established by Martin Holden and Mark Farrimond who have over 10 years experience dealing with window cleaners and the risks they face – this expertise has allowed them to develop policies that are ready made for all window cleaners whether they be traditional window cleaners, reach and wash window cleaners or high level window cleaners. How much is a window cleaning round worth? Like any asset, a window cleaning business is only worth what someone is prepared to pay for it. Unless the seller is including plant and equipment (such as their vehicle and tools) then what you are buying is the ‘goodwill’ of the business. – So what is goodwill? Goodwill reflects the reputation, viability and potential of a business. It can be difficult to give a value to goodwill since it is an intangible asset. To illustrate, The goodwill of a round that has been neglected and worked in a ‘hit and miss’ fashion for a few months would be valued less than that of a round which has been consistently and diligently looked after. Another goodwill factor would include the location of the business. If there is lots of potential to expand the business within the immediate vicinity of the window cleaning round then the viability and potential of the business is increased and that could be reflected in the goodwill. It would be wise to ask to see written records of the accounts for the round in question in determining the goodwill value. Often window cleaners sell their round according to its average monthly turnover. It is known for window cleaning rounds to be sold from 2 months average turnover up to 10 months value. Like anything much comes down to supply and demand. Prices of window cleaning rounds vary form region to region. In an area saturated with window cleaners where canvassing fresh work is difficult, fellow window cleaners may be prepared to pay more for an established round than in an area where window cleaners are few and far between and canvassing fresh work is relatively easy. Of course the nature of the work comes into play also. Commercial work that is low level, well priced and compact would be obviously be worth more than a round of poorly priced terrace houses scattered about on a rough estate. Tips when buying a window cleaning round. Prospective buyers should only purchase a business after due diligence, which means basically acquiring and analyzing all the information you need to make a wise decision. When was the work last done? How established is the work? What income does the round generate in an average month? What kind of methods are the customers used to? Traditional or water fed pole? Is collection usually by cheque in the post or by collecting in the evening? What kind of scope is there for enlarging the round if need be? When were the prices last raised? How long does it take the current window cleaner to do the round? Realistically, what is the average hourly rate achievable? If the seller seems vague about these details and is more interested in getting a deposit from you without giving you opportunity to at least select a few customers at random to verify, then take that as a warning sign. Alarm bells should also start ringing if the seller is reluctant to provide you with personal details such as a home address or telephone number. For a smooth transition the customers should be told what is happening by the original window cleaner. Householders like to know who is coming and who they are paying, so ideally it would be good for you to meet the customers once you are pretty sure that you will buy the work. At this stage ask to choose a random selection of customers from the list and then go to verify that they exist by meeting them. (See below). If you will not be working the round for the first time with the seller, then ask him to give a letter to all the customers to inform them of the change. When you start you may wish to leave your own letter to introduce yourself. Tip: Work a section or all the round for one clean with the seller. This will give you opportunity to get to see first hand not only what the round is like, but it will also give you opportunity to have an insight into the seller’s character. Buying and selling goodwill involves trust and if you don’t know the seller then working alongside him for a day or two will help you develop the mutual trust. Don’t expect to be given the full list of work until you have made at least a deposit. The seller is also taking a risk in giving you the work before he receives the full amount. A fair method for the exchange may be to put half of the amount down as a deposit and pay the other half once you have worked the round once and established that the round is all legitimate, ideally doing this together with the seller and splitting the proceeds. Before you start the work, agree between yourselves as to what will happen in the case of cancellations. Again this requires trust. Both parties should have a written copy of the agreed terms of sale so that any issues that arise can be settled according to the agreement. When there are large amounts of money involved it is highly recommended that you involve a solicitor and seek legal advice for the transaction to be documented. Tips when selling a window cleaning round. If you want the sale of the round to go smoothly then communication with your customers is vital. 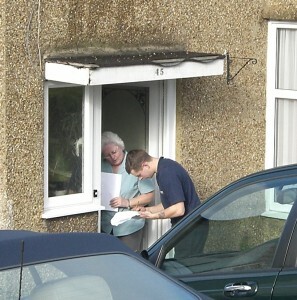 Your customers have a right to know who is coming onto their property to clean their windows. Mention to your customers the change and hand them a letter of notification with the new cleaner’s contact details. You can download a sample letter here for free. Having a name, telephone number and address of the new cleaner will make customers more at ease with the change. Download example changeover letter. “Hello ‘Mr.Smith’, I hope you don’t mind me disturbing you but as I mentioned I may be passing the window cleaning round on to someone else. ‘David’ here is evaluating whether or not to buy the round from me and I’m just introducing him to a few customers for him to see that the round is legitimate. ‘David’, this is ‘Mr.Smith’. He’s a great customer, he has his windows cleaned every month and we’ve been cleaning the windows here for about ‘3 years’”. A few successful introductions like these chosen at random by the prospective buyer, should be enough grounds for a deposit. At that point it would be wise to work the round together for the first time splitting proceeds down the middle. Then the final payment could be made, at which point the seller would hand over the full details of the round. There is often a certain inevitable amount of cancellations when a window cleaning round changes hands. Introducing the new buyer will minimise this, but a strong selling point would be to guarantee the work by offering to refund any cancellations. Alternatively, you could deduct 5% from the asking price to start with to cover any eventual losses during the change over. Think long and hard before selling your work. Window cleaning rounds are a valuable asset that are often underestimated in value. Ask yourself what the round is worth to you. You then need to find someone who is prepared to pay that amount. A window cleaning round is only worth what someone is willing to pay for it. It could be that you are better off keeping the round. Building a window cleaning round – Sow Seed or Buy Turf? Building a window cleaning round from scratch is like sowing a lawn. It would be fantastic to have a nice, thick, luxurious, lawn – the kind that you find on a well kept golf course. But ask any groundskeeper and they will tell you that you don’t get those kind of results overnight! Building a window cleaning round is like laying a lawn. You can either sow seed or buy turf. 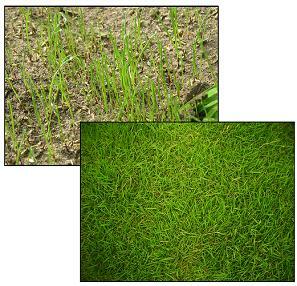 Do you sow seed and grow your own lawn – or buy rolls of turf and have an instantly finished garden? Similarly, anyone that has built a good, compact and lucrative window cleaning round from scratch will tell you that it takes lots of time, lots of determination and lots of will power – but it is achievable. When laying a lawn you have two options: Sow seed and grow your own lawn – or buy rolls of turf and have an instantly finished garden. Although it may cost more, the obvious advantage of laying turf is the speed in which you can have your lawn. Turf is simply rolled out and although it needs to be laid correctly, you can reap the rewards of having a nice lawn for the kids to play on immediately. On the other hand, if you sow grass seed the shoots will appear after a week or so (depending on time of year) and the kids will have to wait to play on the lawn for several months. Growing your lawn from seed will mean weeding out all the undesirables and lots of regular watering to get the lawn looking good and healthy. Yes, you could canvass a round from scratch and the satisfaction in doing so has its own rewards. It takes time, a lot of weeding out unreliable customers, lots of watering with more advertising and more canvassing to pad the round out – but it is achievable. Or you could buy an established round where most of the hard work has been done for you. It may cost more initially, but the time it would take you to reach the same level of earnings (and the loss of potential earnings working a ready made round in the meantime) could very likely make buying a round a sound investment. A combination of the two would likely be the ideal. If you are looking to buy or sell window cleaning work in the UK then you should definitely pay a visit to www.windowcleaningroundforsale.co.uk where you will find hundreds of window cleaning rounds for sale. – If you are looking to lay a lawn then you are best to visit your local garden centre!